We <3 Lauren :: Try one of her Tutorials! Lauren has been going through some hard stuff lately. I won't say what, but she could use your good vibes and love...so send her some comment love to cheer her up!!! And, now, one for the boys. Or girls that like robots, too. Tuck in a tooth and beeept! boop! boink! kaaachink! out comes a special prize. Also good for gift cards, little love notes and special bits dear to little hearts. With the cost of shipping these days, I may just be sending along little dolls with gift cards for upcoming birthdays. It's cute, handmade and they get to go shop for themselves. Everyone wins! Sew face on one side of head piece. Zigzag works great for linen, but felt can be sewn in a straight stitch or even by hand. Center head pieces on body pieces, right sides together and sew. Sew arms together on three sides, right sides facing each other. Turn, press and stuff lightly. Iron pocket in half, making it 2.5" tall, 4" wide. Pin on body piece that has face. Pin on arms, raw ends matching onto sides of the body (arms are pointing in) about 1/2" down on body piece. They will overlap with the pocket a bit, that's okay. Finish your robot sandwich by placing back body piece, face down on top. pin all around. Remove unnecessary pins (don't want them stuck in your pillow...ouch). Sew all around edge, leaving a hole for turning. Remember the hole needs to be big enough to get the arms through. Check before you turn and stuff to make sure you have everything sewn in there all tidy. There's nothing more frustrating that turning and getting halfway stuffed before realizing you have a popped seam. argh. Stuff and stitch opening closed. Add buttons for eyes and embroider mouth, going in under the face to hide the knot. Beep! Boop! You're done! If you like Lauren's Tutorial, make sure to head on over to her blog and check out the amazing tutorials she's shared! Each chapter in this book starts out with a little bit of history behind the craft at hand. The book is a compilation of projects from different well-known crafters so you'll find a one-page bio for each, followed by an outstanding project. The cookie flower pin by Lara Newsom (of www.handmadepretties.com) is a great way to incorporate embroidery into a fun brooch. I'm also loving the ultra-hip vinyl sneaker pouch by Vanessa Brady (www.gerberadesigns.com). The Little birds mobile by Emerald Mosley (www.goldtop.org) is adorable as well! To be perfectly honest, I think all of the projects are awesome! They are super-cute and not too advanced. There are also some tidbits here and there thrown in by the author - information on craft shows and sewing circles, and tools to stock your sewing box with. The "Good as New" chapter is mostly filled with sewing projects - with one crochet and one jewelry project. You know I'm loving the vintage button necklace - that one is right up my alley. The "Electro Craft" chapter is technology based. The projects sort of scare me (I'm not the most technology inclined) but I absolutely love the Nintendo controller mouse and typewriter keyboard. The "Homemade Beauty" chapter looks like it would be a fun one for a slumber party with your girlfriends. It's also great for someone who is looking for all natural beauty products and fun things to try when you are out of your favorite body-wash! The "Home Sweet Home" chapter has a project in it by Julie Jackson of www.subversivecrossstitch.com. I'm not much of a cross-stitcher but I've always wanted to try one of her in-your-face patterns. I'm also loving the cupcake pot holder by Heidi Kenny of www.mypapercrane.com. Seriously, can you get any cuter? "Knitting in Public" has some crafty ideas such as dying with Kool-Aid and un-knitting your sweaters (to re-use the yarn). The "Paper and Ink" chapter has all sorts of fun printing ideas, along with a Print Gocco demonstration. You have to love the paper pad cozy by Jill Bliss of www.blissen.com. The book concludes with all sorts of inspirational links. I'm loving the colors and illustrations, by the way! I will be using this book as inspiration for this year's handmade Christmas gifts. It gets 5 stars! Gather supplies: fabric with pattern drawn on it (this pattern is from my Vintage Flora Patten Collection), floss, needle, beads, hoop. 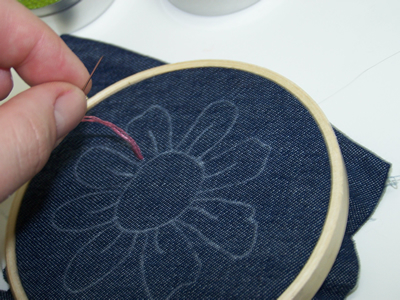 Step 1: Pull the needle through the back of the fabric, like you would for any other embroidery project. 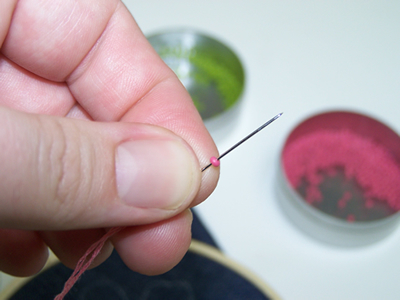 Step 2: Thread a bead onto the needle. I used seed beads here, but just about any kind of bead or sequin will work. 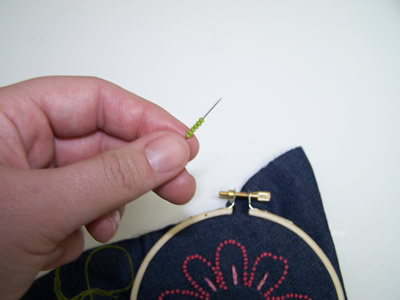 Step 3: After you thread one bead, poke the needle down through the fabric. Stitch as you would any other embroidery stitch - I used the backstitch here. Repeat until you are finished with your design. 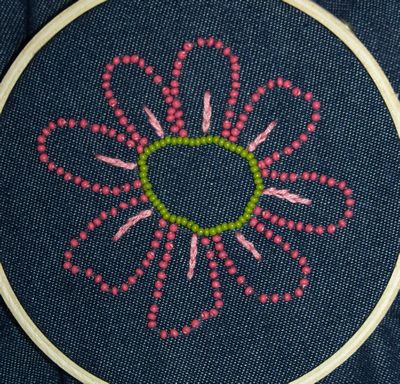 You can also embroider with more than one bead per stitch. 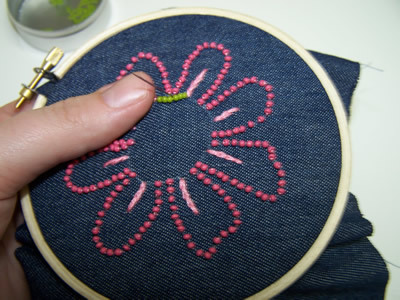 You might try this time-saving method for easy to stitch areas (like the circle in the middle of the flower). 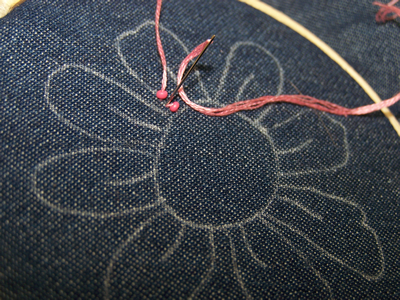 Step 1: Pull the needle through the back of the fabric, like you would for any other embroidery project. Start by threading your beads onto the needle. I used 6 beads per stitch. 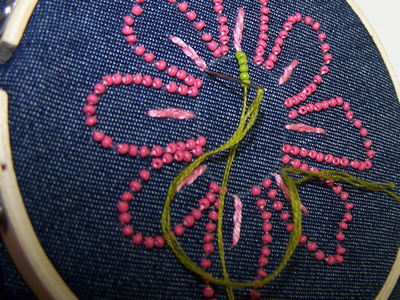 Step 2: After you slide the beads on, poke the needle down through the fabric. 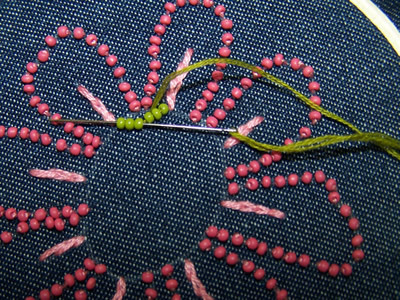 Step 3: Now poke the needle up through the fabric, at the approximate mid-point of the beads you just strung (between beads three and four if you are stringing 6). 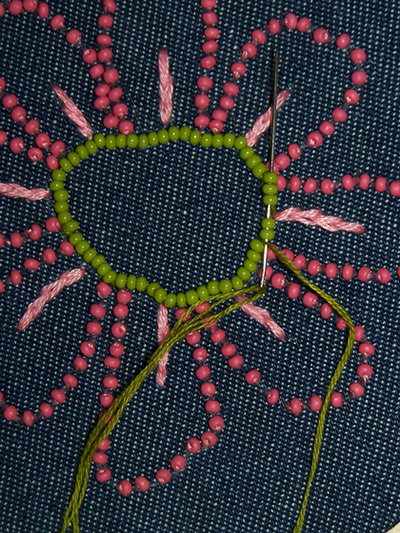 Step 4: Now thread your needle through the last half of your beads. Pull the needle all the way through. Then string another row of beads. Repeat this process until you get to the end of your design. Step 5: When you reach the end, pull the needle through the first few beads you strung to secure them in place. 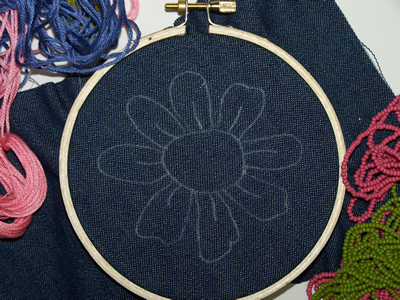 Pull the needle down through the fabric and finish off like you would any other embroidery project. You're done! 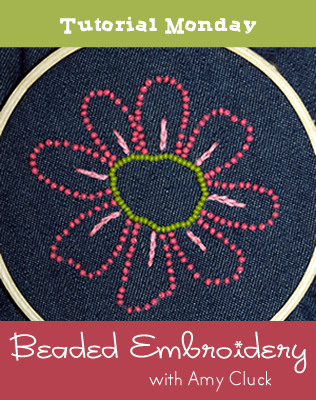 Now you know how to add beads to your embroidery projects! The purpose behind IndieSacramento is to help spread the word about locally owned businesses and to help Sacramento gain the reputation it deserves as a city with cutting-edge design, fashion, and handmade goods — plus great local shopping and eats. Local businesses, fashion designers, and crafters are challenging shoppers to stimulate the local economy by purchasing unique gifts from local boutiques and designers, instead of hitting the malls this holiday season. IndieSacramento will feature approximately 40 independent designers from the Sacramento area and beyond. Local bands will provide entertainment. Craft workshops and demos will teach new skills and encourage creativity among patrons. We will also offer free swag bags to the first 150 patrons, free crafts for the kids, a fashion show, door prizes, and refreshments. Admission: $2 per person or $1 with a canned food item. Ages 12 and under are FREE. There were so many great entries to our Flickr Challenge Giveaway! We think you are all winners and we wanted to feature some of our favorites here for everyone to see! Thanks to everyone who participated! Look for a new Flickr photo challenge soon! When I attended Craft Con (www.craftcon.org) in San Francisco this year, I had the pleasure of visiting Stitch Lounge (www.stitchlounge.com) as part of the walking tour. While there, I bought a copy of Subversive Seamster as a souvenir. The difference between this book and Sew Subversive is that this one focuses more on reclaiming thrifted clothes. The first book contains a lot of recycled clothing projects but it includes mostly t-shirts and sweaters as the basis for projects. Subversive Seamster experiments more with thrifted and vintage styles. The other difference is that this book starts where the last one left off as far as sewing skills (see Sewing 201). Subversive Seamster begins with some thrifting tips and then a section called "Sewing 201" which goes over some more advanced sewing techniques. Some of these include sewing corners, top-stitching, elastic, ruffles, and dying fabric. The book even shows you how to make your own duct tape dress form! "I also found the instructions to be simple and easy to understand. The diagrams were pretty helpful as well. And unlike some of the other books for beginners, this book has a hip and alternative look and feel that both teens and 30-something hipsters would enjoy. I loved the fact that they recycled materials (you'll find mostly de-constructed clothing projects in this book), plus there are tons of great photos." As far as the projects, almost all are wearable in some form (except maybe the pillow sham project). There are instructions for shirts, skirts, gaucho pants, bags and purses, checkbook covers, and even a couple jewelry items. My favorites are The Vest Earrings in Town, Always a Bridesmaid Never a Tie (or Halter), I Dream of Groceries, and This Shirt is the Sheet. If I had to choose, I'd say the projects in Sew Subversive were more my style but they are both must-reads for someone looking to update their wardrobe!